The polymorphism in the gonadotropin-releasing hormone receptor (GnRHR) gene was detected by PCR single-strand conformational (PCR-SSCP) and DNA sequencing methods in 224 Boer goats. Two single nucleotide polymorphisms (SNPs), G891T and G757A, were found in the exon I of the goat GnRHR gene and their associations with litter size in Boer goats were evaluated. Association analysis showed that G891T and G757A had significant effects on litter size. In locus G891T, individuals with GT genotype had significantly larger litter sizes compared to GG genotype in the first and third parity. In locus G757A, ewes with GG genotype had significantly higher litter sizes than those of GA in the fourth parity. The present study primarily revealed an association between allele T at 891 locus of the GnRHR gene and high litter size in the first and third parity in Boer goats. These results provide evidence that the GnRHR gene may be significantly correlated with a high prolificacy in goats. The Boer goat was developed in South Africa in the early 1900s (Casey & Van Niekerk, 1988). The first importation to China was during 1995, and it is now a popular breed for meat production. The breed is well adapted and established in every region of China. Numerous studies have confirmed that farmers prefer the Boer to other goat breeds for its rapid growth characteristics (Vatankhah & Talebi, 2008; Zhang et al., 2008). It has been accepted, in general, that the economic efficiency of a flock of goats is dependent on total productivity (Khanum et al., 2007), and this productivity is more dependent on fertility and prolificacy of the dams than any other component (Boujenane, 2002). It will, therefore, be meaningful to use a candidate gene approach to identify genes that influence litter size in Boer goats. The hypothalamic gonadotropin-releasing hormone receptor (GnRHR) is a key regulator of the reproductive system, which triggers the synthesis and release of the luteinizing hormones (LH) and follicle-stimulating hormone (FSH) in the pituitary gland (Millar, 2005; Rispoli & Nett, 2005). Previous studies demonstrated that PKC and various downstream signal, transduction cascades were activated following the binding of GnRH to GnRHR (Kraus et al., 2001; Millar & Pawson, 2004). These pathways then differentially regulate the synthesis and release of the gonadotropic hormones; LH and FSH, that in turn regulate the production of gametes and gonadal hormones (Naor, 2009). In the absence of sufficient FSH or LH, follicles fail to develop beyond the early antral stage, and therefore ovulation does not occur (Barnes et al., 2002; Clarkson & Herbiso, 2009). Due to the central role of GnRHR in regulating gonadotropin synthesis and release, the GnRHR gene appeared to be a good candidate for mutations associated with reproductive performance (Bédécarrats et al., 2003). The aim of the present study was to detect new SNP in exon 1 of the GnRHR gene in Boer goats by PCR-SSCP, and to investigate its association with litter size. Genomic DNA samples were obtained from 224 Boer goats, with records in the Yidu Boer Goat Breeding Station, under common rearing conditions from 2003 to 2007. Genomic DNA was extracted from white blood cells by using the standard phenol-chloroform extraction protocol. Records of litter size for Boer goats from the first to fifth parity, were collected for statistical analysis (Table 1). According to the DNA sequence of the sheep GnRHR gene (GenBank accession number: L42937.1), a pair of primers (sense: 5-CTCGTTCGCTTTAGCACCC-3; anti-sense: 5- CTGTGGTCCAGCAAA GATG-3) was designed to amplify exon 1 of the goat GnRHR gene. PCR reactions were performed in a 20 µL reaction mixture containing 10 µmol of each primer, 200 µM of dNTP (deoxyribo nucleotide triphosphate), 2.5 µL of 10 × reaction buffer which contained 1.5 mM of MgCl2, 0.5 unit of Taq-DNA polymerase (Promega, Madison, WI) and 50 ng of genomic DNA as template. After denaturation at 94 ºC for 5 min, 32 amplification cycles were performed comprising denaturation at 94 ºC for 45 s, annealing at 62.0 ºC for 45 s, and extension at 72 ºC for 45 s, followed by a further 10 min extension at 72 ºC. PCR products were electrophoretically detected on 1.2% agarose gel (5 V/cm) by staining with ethidium bromide. Aliquots of 4 µL of the PCR products were mixed with 10 µL of a denaturing solution (95% formamide, 25 mM EDTA, 0.025% xylene-cyanole and 0.025% bromophenol blue), heated for 10 min at 99 ºC and chilled on ice. Denatured DNA was subjected to 10% polyacrylamide gel electrophoresis (PAGE) (39:1 acrilamyde:bisacrylamide) in 1 × tris-borate EDTA (TBE) buffer at constant voltage (120 V) for 10 - 16 h. The gel was stained with 0.1% silver nitrate and the PCR products, with different SSCP patterns, were sequenced in an ABI PRIZM 377 DNA sequencer to identify the SNP. The PCR products were digested with MspI and EarI (TaKaRa, Tokyo, Japan) according to the sequencing results. The digestion mixture contained 4 µL PCR products, 1 × digestion buffer, 4.0 U of each enzyme and digested at 37 ºC overnight. Fragments were separated on 2% agarose gels and visualized with ethidium bromide staining. Where Yjbcs is the phenotypic value of traits; µ is the mean; Gj, Ab, PC and Ks are the fixed effects of the genotype, age, parity and kidding year, respectively; ejbcs is the random residual error. Polymorphisms of the goat GnRHR gene were detected by PCR-SSCP (Figure 1) and DNA sequencing. In order to better describe the different genotypes of G﹥T and G﹥A mutations of the goat GnRHR gene, we named the alleles 891-G, 891-T, 757-G and 757-A, respectively. In locus G891T, the mutation G﹥T (GAAGAG to GAATAG) destroys an EarI endonuclease restriction site (GAAGAG). Therefore, the EarI digestion of amplified products shows two fragments (425 and 324 bp) for 891-G allele and one fragment (749 bp) for 891-T allele (Figure 2). In locus G757A, the mutation G﹥A (CCGG to CCAG) destroys a MspI endonuclease restriction site (CCGG). Therefore, MspI digestion of amplified products shows two fragments (449 and 300 bp) for 757-G allele and one fragment (749 bp) for 757-A allele (Figure 2). Frequencies of 891-G, 891-T, 757-G and 757-A, alleles were 0.951, 0.049, 0.925 and 0.075 in the analyzed population (Table 2). In the present study, the homozygous TT and AA genotypes were not detected in the GnRHR gene, similar to a previous finding in bovines (Yang et al., 2011). We speculated that these genotypes may have a negative effect on reproduction, so that ewes with this genotype might have been eliminated through the process of artificial selection and breeding programme, due to their extremely poor performance in reproduction. It is also possible that TT and AA genotypes were not found in the study population due to its low allele frequency. Therefore, our results should be further validated in larger goat populations. Litter size was significantly influenced by age, parity and kidding year (P <0.05). The parity of the dam had a significant effect on litter size (P <0.01), least-square means of litter size was the smallest at the first parity, and increased with each parity from 1 to 4, and then decreased in the fifth parity (Table 3). The results of the association analysis between GnRHR genotypes and litter size are given in Table 4. 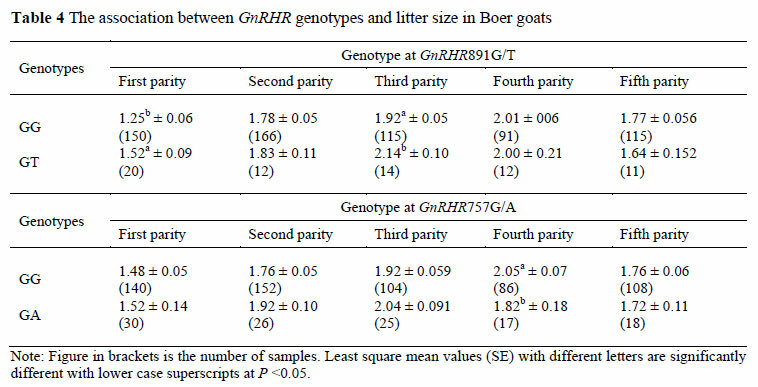 The statistical analysis revealed that those two SNPs (G891T and G757A) only had a significant effect on litter size in certain parities in Boer goats. In locus G891T, individuals with GT genotype significantly outperformed individuals with the GG genotype (P <0.05) with regard to litter sizes of 0.27 and 0.22 kids, respectively, in the first and third parity (Table 4). In locus G757A, ewes with GG genotype had larger (P <0.05) litter sizes by 0.23 kids in the fourth parity than ewes with the GA genotype (Table 4). This may contribute to the limited sample size of the Boer goat in the present study and the results should be further validated in larger goat populations. Although those mutations do not change the amino acid sequences, it probably affects the density of GnRHR on the gonadotropes by influencing the expression of the GnRHR gene and the stability of the GnRHR transcription, and could then result in a decrease or increase of gonadotrophins concentrations (Schubert et al., 2000; Leanos-Miranda et al., 2002). It has been observed that the synonymous SNP can affect in vivo protein folding and consequently its function, as well as gene expression and phenotype (Kimchi-Sarfaty et al., 2007; Ren et al., 2010; Tang et al., 2011). In summary, our results identified two new polymorphisms (G891T and G757A) in the goat GnRHR gene, and showed an association with allele T at 891 locus between the GnRHR gene and the high litter size in the first and third parity in Boer goats. Due to the lack of functional data, the conclusion was not final/irrefutable and further studies are necessary for the validation of these polymorphisms. This work was supported by programme 863 (No.2008AA101010) and National Key Technology R&D Programme (No. 2006BAD04A02-11). Condition of use: The user may copy, distribute, transmit and adapt the work, but must recognise the authors and the South African Journal of Animal Science.